Welcome Love Art Wonders Readers! Today I will share with you our recent painting for the month of JULY. God impressed me with this idea last night and I couldn’t wait to create this picture. This happens to be one of my favorite paintings that I’ve created. The most reason why is because it has to do with the way God’s loves us. There we can see how Jesus was given to us, for us to live forever! He came from the Father and brought purpose to humanity by revealing life to us apart from evil. Below is my attempt of trying to capture this painting and the love of God in a beautiful way towards us. 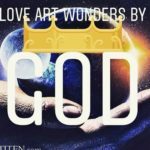 God is love <3 is the theme for this month of July with Love Art Wonders and the heartbeat of us all. Nothing that we do or changes we go through can change God’s love for us. Its a reminder always that we have him by our side. Hope you enjoyed this month’s sketching choice and the heart beat for Love Art Wonders. God bless us all! You are welcome Love Art Wonders by God. In one word of being a witness for the Lord. Amazing.